Bulfra offre aussi des proprietes au ski et a Bovets. One of the most ambitious projects, which will be developed during the next few years, is SUPER BOROVETS. Super Borovets Project plans to transform the region into a year-round resort with football fields, tennis-courts and other playgrounds for practicing active sports, as well as swimming pools and numerous amusement facilities. The plan makes provisions for riverside parks with additional attractions, including a horse riding centre and dairy farm with taverns in the area of Byala Polyana, close to Borovets. The aim of the project is to develop the tourism sector with the help of the local people, whilst at the same time, trying to observe the eco-balance of the region. There will be no large hotels high in the mountain, only shelters or tea-rooms. The plan was issued by a team of architects, lead by Petko Evrev and will follow the requirements of the Encouragement Law, according to which the infrastructure will be provided by the state. The plan foresees the opening of a Tourism College in the town of Samokov and is consistent with the Bulgarian candidature to host the Olympic Games in the year 2014. - The first stage is to be completed in year 2007 and by that time the accommodation capacity of the resort will be doubled. New gyms and swimming pools will be built. - The second stage will start when ownership rights are finalized. At this stage, the plan envisages new hotels and ski runs in the triangle enclosing Beli Iskar, Samokov and Borovets. - After that, during the third stage, they will start the construction of new sites at 1400 m above sea level. Because of the height and sparse terrain only holiday villages and small hotels will be allowed there. Real goal: transforming Samokov and North Rila region into the most attractive tourism complex on the Balkans. Lower Borovets- to 1300 meters- new site with family houses and hotels with traditional Bulgarian architecture with almost 5 000 beds. Real Borovets- 1300- 1350 m- hotels with a total capacity of 10000 beds. Ecological risk- grounded on the fact that part of the project will be on the territories of the Natural Park Rila. The project plans a construction of a new Gondola Station and improved snowboard runs – when completed the mega resort will offer 33 ski runs with a total length of more than 60 km (twice as much as now) and thus will allow more than 10 000 skiers per hour to enjoy the ski runs and facilities. (The current capacity is 2500 skiers per hour). The new Gondola will also connect this part of the resort to the other runs, Sokolets – Ivanov Kamuk – Marakudjitsite. Brand new golf course will be build at the foothills of the Rila Mountains with spectacular views over the snow-capped peaks. The project aims to offer numerous tourism attractions for the development of sustainable tourism in the region. The region of Borovets will become a year-round resort with modern technical facilities, information centres for tourists and a good transportation infrastructure. Special attention will be paid to hill walkers, extreme sports enthusiasts, and horse- back riding trails, the development of eco-tourism, as well as hunting and fishing. The summer of 2004 marks the start of the Super Borovets Project. The project was estimated to cost 300 million Euros. The ski tourism in Bulgaria was prepared for a jump. By that time, the ski tourism provided just 15% of the total tourism revenue from tourism. This percent was almost equal to the out of season one and in the inner parts of the country. In certain business circles became clear that the winter tourism can bring almost the same revenues as the summer tourism and the ski can turn into a way of living in Bulgaria. “A million and one resort wishes” appeared in the municipals. The property market enlivened. All this activated the ecologists, whose opinion is that it is not worth to build such an imposing infrastructure for not more than three months active season. Borovets and Pamporovo have been built by the end of the 60s and the beginning of the 70s last century, covering the old standards of that time. The response of the new ski investments was the idea Borovets to be made three times bigger that it is now with investments for nearly 300 million Euro. The building of ski resorts is a mutual inspiration of the mountain municipals, the investors and the local population, who foresee a way out of their economic backwardness, new territories for development and end of unemployment problems. When the enthusiasm led to a particular investment in the infrastructure – for example for the construction of a cabin-lift in Bansko, it becomes attractive for a larger group of people. Property investors come up on the horizon, foreigners looking for rural properties, construction undertakers, looking for rapid profits from vacation apartments. The property market in the region enlivens and the local people can receive higher price for their property. The high risk from the winter resorts is that precious natural resources are sacrificed for their prosperity- trees are being cut. This does not look worthy if the resort is not filled through the whole year. The global heating makes the three months winter season on the level of out mountains doubtful. The investors are also aware of that fact and that is why they prefer the highest parts of the mountains. In that way, they are tempted to enter the five percent protected territories in Bulgaria. That is why the parliament received a governmental bill for a change in the law for the protected areas in Bulgaria. It makes it easier to transform the ownership from public-national or municipal in a private one, when there are current plans for management and detailed system plans. The Eco- organizations reacted loudly at the attempt for construction works in the protected territories. However, for the moment, the ecologists were mainly corrective. The problem is that no one suggests more attractive alternative to the municipals. The green tourism is nature friendly but the profits are not so big and are spread in time. It is also not of such interest for the investors. May 2005 – the Government announced that the state would take care of the infrastructure in the region for the fulfillment of the major project. The state plans to invest 150 million BGN. Private investors are expected to inject a further 300 million Euro into tourist infrastructure, lifts and ski runs. The document approved by the Cabinet bears the title “Concept for the Development of the Borovets Mountain Resort until 2015”. It was adopted in line with Bulgaria’s candidacy to host the Winter Olympic Games in 2014 and envisages three stages. The first stage covers the period until 2007 when the occupancy rate of the resort must increase twice its current levels. The second stage will start after the ownership structure has been finalized, along with the cadastral plan, the environment impact assessment and the general spatial development plan. Tourist facilities in the area incorporating Beli Iskar, Samokov and Borovets will be built during the second stage. The third stage envisages construction of facilities in the mountain over 1400 meters latitude. A total of 10 000 jobs are expected to be created during the building phase. Most of the ski runs were built in the late 1970s according to the standards of the time, 30 meters wide. In order to meet the modern requirements the runs must be widened. The runs are now served by a network of cable cars and tows with overall capacity of 12 000 people an hour. 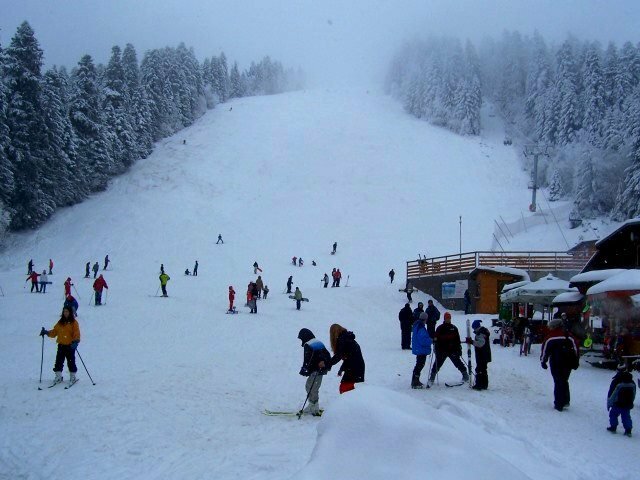 Borovets has six snow machines and two ski runs for night skiing, and a special snowboard run with a separate tow. Several new hotels and apartment houses were constructed for the 2005/2006 season. The first major obstacle before the execution of the project was the sudden death of Emil Kulev who was one of the members of the Initiative Committee. The municipal wanted additional guarantees against selling off small plots of municipal land. In December the same year, it became clear that the work on project Super Borovets will continue. The ski lifts are planned to pass through the land property, given back to former Prime Minister Sax-Coburgotta. He gave his permission some time ago but the documentations was still to be finalized. Now several Italian equipment producers are interested in investing in the project. They will negotiate with the committee for cooperation in the project. It was clear that the development of the ski tourism could not be altered. The main idea is to be kept in the proper areas, and not to let it damage the resources for the development of eco- tourism.